Leon Panetta: The Battle-Tested Politician Two months into his tenure as secretary of defense, Leon Panetta has to run two ground wars, keep up the fight against al-Qaida and figure out how to cut more than $400 billion from the defense budget. Defense Secretary Leon Panetta speaks to reporters after touring the National September 11 Memorial & Museum in New York City last week. When Leon Panetta was CIA director, he helped lead the effort to find and kill Osama bin Laden. Now, Panetta may have an even harder job. He's two months into his tenure as secretary of defense, and here's what Panetta has to do: Run two ground wars, keep up the fight against al-Qaida, and at the same time figure out how to cut what could end up being a trillion dollars from the Pentagon's budget. Now, Washington is a serious town, and clearly the Pentagon is a serious place where serious things happen. So the first thing you really notice about Leon Panetta is his laugh. It comes easily and is often contagious. But underneath that disarming laughter is a battle-tested politician. His quick smile and easygoing style have helped him win allies in tough Washington fights — as a Democratic congressman from California, as both White House budget chief and White House chief of staff under President Clinton, director of the CIA, and now secretary of defense. "If you had asked me 10 years ago if on the 10th anniversary of 9/11 that I would be secretary of defense for the United States, I would have said, 'You're smoking something' — that the likelihood is that I'd be back in Carmel Valley working my walnut farm," he says. "And yet, here I am in this job, and as always, you know, for a kid who is the son of immigrants, it is a very special honor to be able to sit in this office and have a responsibility to carry on the mission that flowed from 9/11." Panetta paid a visit to the Sept. 11 memorial on a very rainy day in New York City last week. Mayor Michael Bloomberg met him at ground zero. Dressed in dark trench coats, the two men huddled under umbrellas as they walked through the memorial. The mayor pointed to the two large reflecting pools that now occupy the space where the twin towers stood. Each pool is an acre large, surrounded by 30-foot waterfalls — the names of those who died there etched into the sides of the monument. 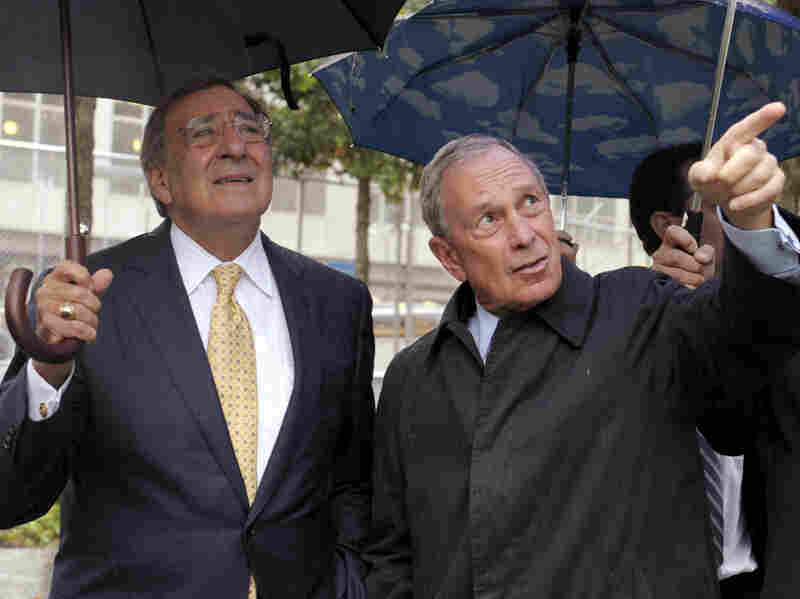 "It will be a place where people will come to reflect," Bloomberg told Panetta. For the past two years, Leon Panetta was at the center of the U.S. fight against the terrorist network that carried out those attacks. As the director of the CIA, he oversaw the secret operations targeting al-Qaida operatives. "I suddenly found myself in a situation where I was getting calls in the middle of the night dealing with operations that involved life and death. That was significant for me, and you know as someone who was raised as a Catholic and is faithful to my religion, I take those decisions not very lightly. And so ... not only do you have to make a decision — go, no go — but then those decisions stay with you for a while," he says. Panetta helped lead the operation last spring that killed Osama bin Laden. He had come into the CIA as an outsider, charged with leading an organization still licking its wounds after the intelligence failures of Sept. 11. 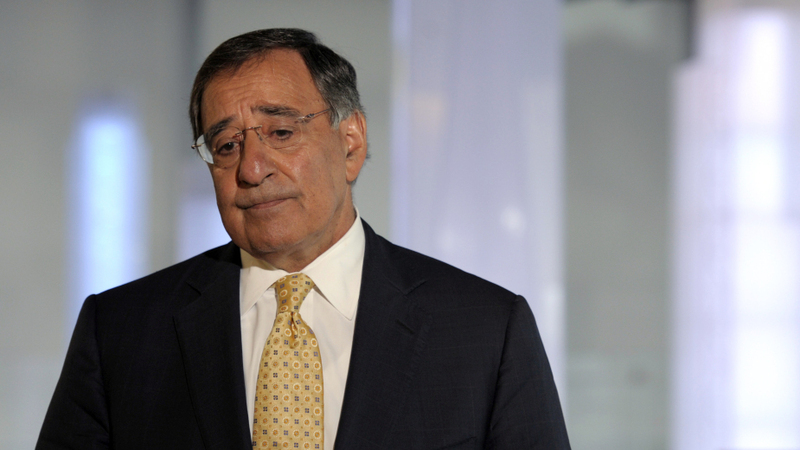 Panetta had to win the CIA's trust, prove he had the agency's back — especially with Congress. Former and current intelligence officials say he did just that. Bin Laden's death was a victory for the CIA, and it sealed Panetta's legacy within the intelligence community. But running the Department of Defense is an altogether different job. New York City Mayor Michael Bloomberg (right) shows Panetta the World Trade Center Memorial. Panetta is still trying to figure out how to place someone — their rank, unit, where they're served — based on decorations on their uniforms. "I've gotten better at it," he says. He's also still learning his way around the labyrinth that is the Pentagon. The other thing he's trying to navigate is the budget crisis: how to make the more than $400 billion in defense budget cuts already ordered by Congress as part of the deficit reduction deal this summer. The congressional deficit "supercommittee" could end up cutting the Pentagon's budget another $200 billion to $500 billion. Panetta is waging a personal campaign to keep that from happening. "There's a price to be paid here for the cuts that are being made," he says. "And I've got to show the Congress, show the country, that there are going to be some tough choices that are going to have to be made here. I think the service chiefs are prepared to make some of those tough choices. As long as we're dealing with a number that frankly is something that we can do, that we can implement over the next 10 years." For Panetta, the bottom line is the billions of dollars that Congress already asked him to cut. That, he says, will be hard but doable. Anything more than that, he says, will end up making America less safe. "You've cut everything across the board so badly that you can't provide good training, you can't provide support, you can't provide good benefits, you can't provide good weapons, and the end result is that you have an ineffective military." As it is, Panetta said the overall size of the force is going to have to come down, and he's looking at cutting some weapons systems — maybe even pay and benefits. To do that, he'll need buy-in from the service chiefs and the rank and file. But like the CIA, the military has its own culture and language, and in his first couple of months, Panetta has made a couple of missteps. For example, during that visit to New York City last week, he told reporters he brought some service members with him to see the Sept. 11 memorial. "I brought five soldiers with me, each came on after 9/11. They are part of each of the services that serve America," he said. He used the term "soldier" there to describe members of the Navy, Air Force, Marines and Coast Guard. Problem is, "soldiers" only refers to the Army. It's not a huge gaffe, but it's the kind of mistake that drives the military crazy. But Panetta is new on the job. There's a learning curve. And trust takes time. "You've got to be honest with the people," he says. "You have to be honest with yourself. You can't pretend you're something different than what you are, and as long as you're straightforward — as long as you call it the way it is — I think ultimately you do build a kind of trust that brings a team together." But how much more difficult is it when he is asking folks to do more with less? "It isn't the first time I've had to do that," he says. "And the only way you can do that is, you cannot shove these decisions down peoples' throats. You gotta make them be part of the process, and also accept some of the responsibility to do it." Just like at the CIA, Leon Panetta is an outsider trying to work his way in, and the ultimate responsibility is his.